These quick and easy No-Bake Chia Seed Granola Energy Bars are perfect for after-school snacks or on-the-go breakfast. Simple and healthy and packed with nutrients, this no-bake bar will give you the energy you need to get through the day! Get ready for back to school with the perfect afternoon snack the kids will love. These No-Bake Chia Seed Granola Energy Bars are a perfect after school snack. This quick and easy recipe is packed with energy-giving nutrients. 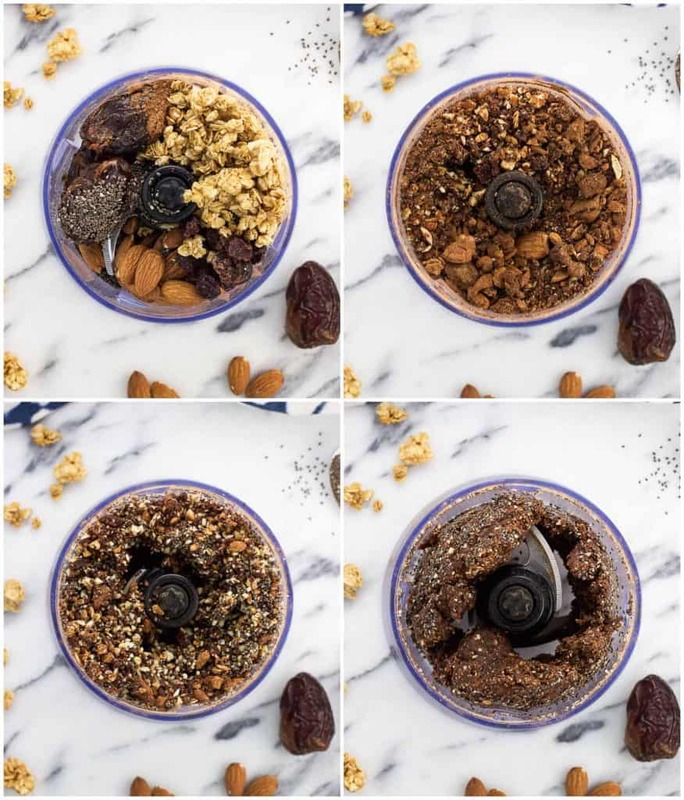 Chia seeds, Medjool dates, nuts, and Cascadian Farm Organic Oats & Honey Granola are the key ingredients to making these energy bars a simple and healthy treat that can serve as an after-school snack or an on-the-go breakfast. Lay down a sheet of plastic wrap and turn out mixture onto the center. Place another sheet of plastic wrap over top and press mixture into a rectangular shape around 1/2" thick. Press into the sides to ensure no pieces become separated. Wrap the rectangle tightly with the ends of the plastic wrap sheets and refrigerate for at least 30 minutes, or until firm. Slice into eight bars. Home Chef Tip: These trail mix bars are best stored in the refrigerator so they hold their shape very well. They'll be fine at room temperature, just a little more malleable. Like these easy after-school snacks? Try These! You’re sure to become addicted with your first bite of these homemade Cranberry, Almond, Peanut Butter Granola Bars. With no baking involved, this is one of the simplest and most delicious after-school snacks you’ll ever make! Make back-to-school mornings less hectic when you start your day with Gluten-Free PB&J Overnight Oats. Prep time for this simple make-ahead breakfast is minimal and you’ll be happy to have your healthy, on-the-go breakfast ready for you when you wake up! This Baked Strawberry Banana Chia Oatmeal is packed with fresh, healthy ingredients. So simple to make, it’s the perfect breakfast recipe! We hope you enjoy these No-Bake Chia Seed Granola Energy Bars from My Sequined Life as much as we do. If you love this recipe and you’re looking for more like it, you can visit readyplansave.com for more recipes and money savings. For daily recipe inspiration, subscribe to our newsletter, like us on Facebook, and follow us on Pinterest. Enjoy!